Poster children like veterans should be more than photo ops! I am going to switch gears today to discuss supportive alliances. Polio survivors have had numerous alliances over the years and often the survivors were not even aware of them. One of those alliances was in the form of the Canadian Paraplegic Association and by extension Canadian veterans. Although formed to support returning WWII veterans with spinal cord injuries the Canadian Paraplegic Association became a major voice for polio survivors. Prior to World War II there were few survivors of spinal cord injury (SCI); virtually all died shortly after injury. Veterans who managed to survive the tragedy of combat during WWII returned to Canada to find a country with little to offer people with disabilities, except to perhaps languish in a veteran’s hospital or ill equipped nursing home. The same changes attributed to the longevity of polio survivors also contributed to the successful survival of these vets. Advancements in health care and technology. The Canadian Paraplegic Association came about following World War II due to the high numbers of spinal cord injuries returning as veterans. A group of veterans decided to take matters into their own hands to advocate for better conditions and opportunities for vets with spinal cord injuries. In 1947 Harold Ballard offered free office space in the Toronto Maple Leaf Gardens to a group of veterans and the CPA was born. Once the CPA had their foot in the door they began to become a voice for a wide range of individuals dealing with paraplegia and polio was one of those groups. The connection between veterans and polio survivors was born shortly after the Korean War and the introduction of the polio vaccine. That connection became a relationship that has existed for over 60 years so when I read about the federal government denying any “social contract” with vets I knew I had to speak up. Social contracts are not new to the Government of Canada and denial of them is not new to the Conservative Party. Paul Martin Senior, was the Liberal Minister for National Health and Welfare from 1946 to 1957. He was also a polio survivor from 1907. He spearheaded the introduction of the polio vaccine and sat as the honourary chair of the day for the March of Dimes. His government entered into a “social contract” with polio survivors telling them they would never have to worry about supports from a monetary perspective. In 1957 the Progressive Conservative under the leadership of Diefenbaker took power and began to back off from that agreement almost immediately. This social contract was renewed and extended to survivors of the thalidomide debacle of the early 60’s. Even though this drug had been pulled off the market in Europe and other countries due to birth defects the PC government of the day in Canada refused to act. When the Liberals came back to power in 1963 they took up the cause and offered support to all of the babies who had been affected by this inaction by reopening the concept of the social contract. There is a history of social contracts in Canada and sadly there is a history of the Conservative governments backing away from them. There is a strong connection between Canadian veterans and polio survivors. 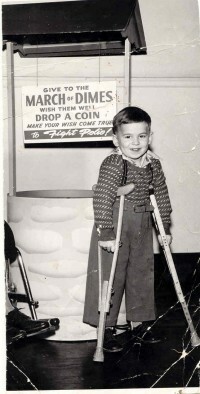 Most of todays polio survivors are children of veterans. Most baby-boomers are. My father was a veteran and support from the Canadian Legion played a big part of the financial support my father received due to their polio fund. There is a strong connection between veterans and polio survivors which I will never forget. So when I read how this government denies any social contract exists with our veterans I get angry. When I see a $4 million ad telling Canadians really nothing except to promote the Conservative government I get angry. This government can waste 4 million in tax dollars while shutting down veterans centre and eroding services to veterans makes me angry. As someone who has spend a lifetime fighting for the rights of polio survivors I cannot sit back and let this go unchallenged. I know how the issues facing veterans are dividing them. This seems to be what this government does. They use a very divisive approach which turns people against each other and I am seeing this in the veterans community. I have also seen this approach work well with members of the community living with disabilities. After all it is quite frightening to think you are biting the hand that feeds you. With that said, when you are invited for a meal and upon arrival you are placed in the kitchen and given the scraps the hand isn’t really feeding you. I will always support vets because they were always there for me. They were always there for our country. My dad, my uncles and so many others did not go to war because it was a hobby. They went to fight for freedom and democracy. We are now faced with the slow erosion of everything they fought, died and suffered for. I cannot in good conscience sit back passively and let this type of behaviour continue. I know @PatStogran is trying to get one million followers on his Twitter account to show that Canadian believe in our vets. Pat Stogran is continuing his battle for the rights of veterans and I would plead with everyone who reads my polio diaries to show your support by signing up to follow him. After all if this government can deny our veterans what they deserve then why did we send them off to fight for democracy? This entry was posted in Disability, Personal Life and tagged Canadian Legion, Canadian Paraplegic Association, Canadian veterans, living with a disability, Pat Stogran, Polio diary, social activism, social contract, Terry Wiens. Bookmark the permalink. “when you are invited for a meal and upon arrival you are placed in the kitchen and given the scraps the hand isn’t really feeding you” Truer words were never spoken!